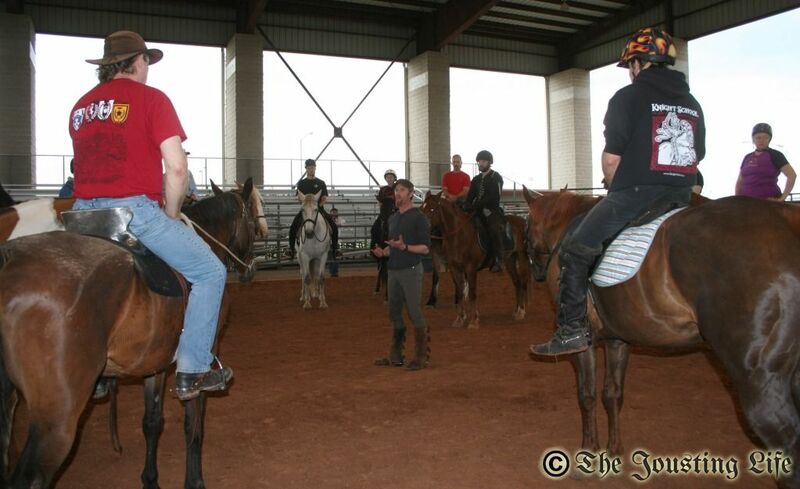 Mounted Combat 1: Rolling and Falling from Horseback with instructor Theresa Wendland and assistant Douglas Wagner. 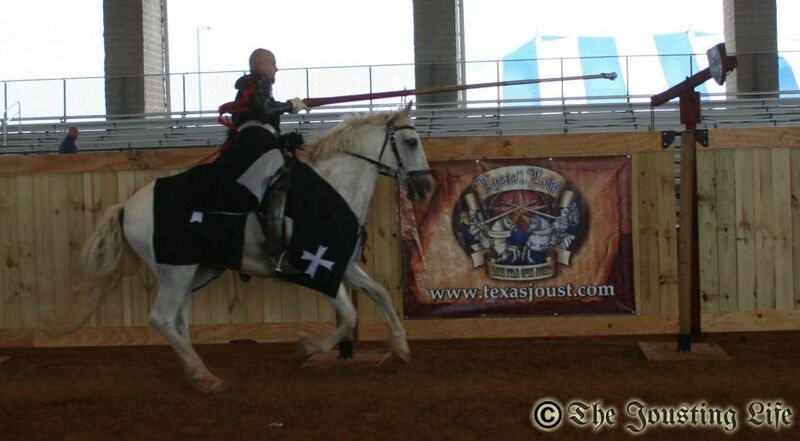 In the Jousting 2 class, Luke Binks explained how to handle a lance while on horseback, and he had the students make runs against the quintain to practice lowering their lances, hitting a target and raising their lances again. 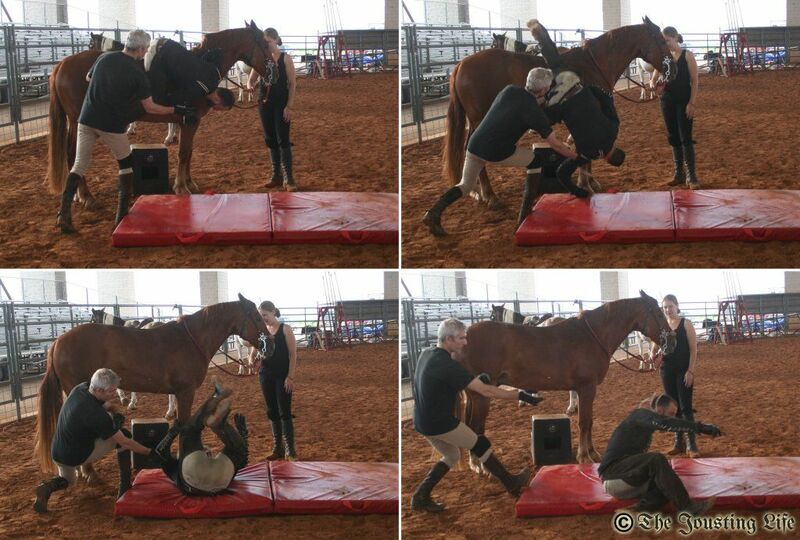 In the Mounted Combat 1 class, Theresa Wendland and her assistant Douglas Wagner taught various ways of falling and rolling. Theresa and Douglas would both demonstrate the move properly and then help the students to perform it. Fist they taught falling and rolling while standing on the ground. Then they taught falling and rolling off of two (very patient) horses, Red and Pocket. The first style of falling off the horse involved simply draping oneself over the back of the horse on one's stomach -- not exactly a normal riding position -- and then falling off into a forward roll. 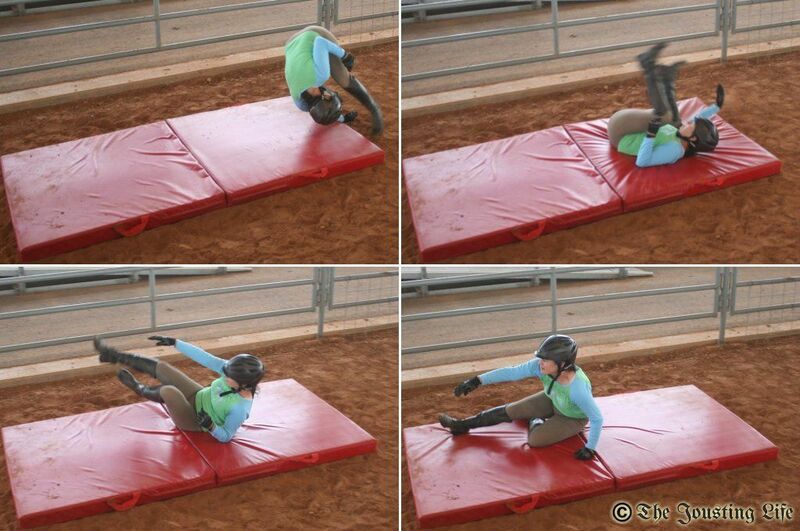 The second style of falling off of a horse involved starting from a regular position sitting on the horse, then leaning forward and rolling over the horse's shoulder and onto the ground. Everyone involved seemed to have a good time, and several comments were heard about how interesting and useful the classes had been. On a personal note... I had a very bad fall off of my horse a couple of years ago. I was so badly injured and frightened that I have only ridden a few times since then and only at a walk. In between taking pictures, I participated in the "Rolling and Falling from Horseback" class and confronted a few of the demons that have been inhabiting my brain since my fall. I don't think that I exorcised them completely, but I do think that I diminished their ability to influence me.